Always… hang your gown by loops located inside the gown that are connected to sturdy side seams, never by fragile shoulder seams that can stretch or sag. Always… avoid storing your gown in plastic bags or vacuum-sealed, plastic-wrapped containers because plastic emits fumes that can yellow the gown and can trap moisture that that can mildew the gown. 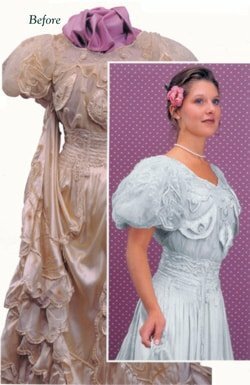 It is essential to properly care for and preserve your wedding gown for use by future generations. Always… clean your wedding gown before you store it. Stains from oil, beverages, make-up and other spills can discolor your gown and set permanently if not removed promptly. The sooner the gown is cleaned, the less likely the stain will set. Always… choose a specialist who will personally process your gown, never one who mails your gown away to be cleaned. Always… ask what precautions the specialist takes to protect delicate trims and decorations and how the cleaner guards against latent stains. 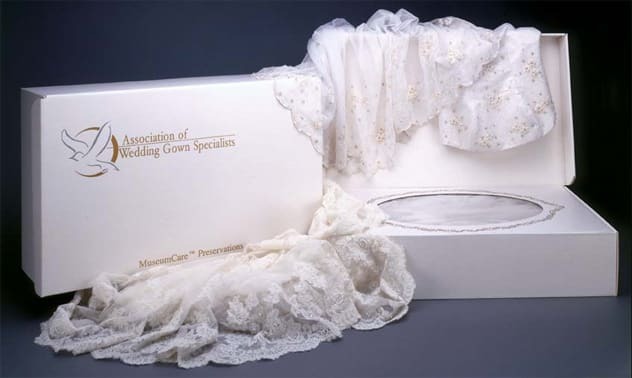 Always… ask to inspect your gown personally before it is put into the container, which should be a pH neutral or acid-free box lined with fabric or acid-free tissue. Always… avoid storing your gown in the attic or basement where there are extreme changes in temperature or humidity. Store it in a cool, dry location. Ideal locations would be under your bed or in the back of your closet. Accessories will be stored with your gown after being wrapped individually with acid-free tissue would include veils, headpieces, gloves, slips, garters and handkerchiefs. Accessories to be stored separately from your gown would include shoes, bouquet, anything with pins, perspiration shields and foam padding. If you have questions, comments, or any other requests - please just let us know by completing the form below. We will strive to respond within one business day. Las Vegas Wedding Gown Specialists are here to help make your wedding day special. "Las Vegas Wedding Gown Specialists"